This image was posted on the Milwaukee County Sheriff's Office Facebook page. The man in the image has filed a formal complaint against Sheriff David Clarke. 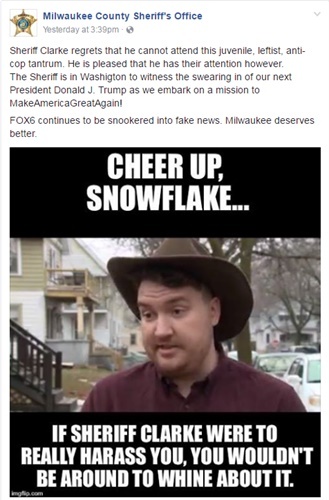 The Milwaukee County Sheriff's Office posted a meme on its Facebook page Thursday featuring a picture of a man who says Sheriff David Clarke abused the power of his office after the man took exception to the sheriff's support of the Dallas Cowboys over the Green Bay Packers on a flight from Dallas after an NFL playoff game between the two teams. Riverwest resident Dan Black filed a formal complaint Tuesday with the county, alleging that sheriff's deputies interrogated him and treated him "like a criminal" at Mitchell International Airport after a conversation he had with Clarke while on board a flight from Dallas on Sunday. Those who support Clarke told WISN TV without witnessing the confrontation on the plane it's hard to know what really happened between the two men.